Wow, this is the last day of the challenge. Feeling a mixture of relief and sadness as I type this post, I think I have learned even more this year from the challenge. Write for me. There was a post in the middle of the month on which I received no comments. I was surprised by how it made me feel. I actually thought about not continuing. Why am I writing if no one responds? Aren’t we writing for an audience, just as we teach our students? Digging deeper, I realized that I should be writing for me, too. As I write, I learn, grow, think, experience again, and express myself. Comments are like icing on the cake. But the icing is nothing without the cake. Dig deep. On more than one occasion, I had to dig deep, but this time I’m referring to topics. This is my second year to participate in the SOL, and it seemed much more difficult to find something to write about. Several days during this month, I had nothing…I mean NOTHING. I spent much more time in silence, thinking about what to write. Obviously, I was successful, but it wasn’t easy! One of my friends and fellow slicer, Nellie, suggested planning ahead with ideas for slicing well before the month of March. In addition, she proposed using one day a week for a theme. I loved these ideas and hope to try them out next year. I would include silence…time for thinking about topics. When I was able to slow down to just sit and think, ideas eventually came to me. Be confident. This year, I enjoyed commenting so much more than last year. On my first challenge, commenting was something I simply checked off to complete the challenge more than anything else. On my second experience, I enjoyed the other authors more and truly felt the value of saying something about someone’s writing. After reading and responding, I feel that I KNOW more of the participants through their words. Through reading and commenting, I gained the confidence that comes from realizing that we are all just people living life. We are equals in this one endeavor, which lessened the insecurities of writing for an audience which includes many well-known names. I am enriched from this experience, as I was a year ago. I am proud and humbled by being a part of a wonderful community of writers who teach, support, and include. Recently, I read Melanie Meehan’s post about relationships on Two Reflective Teachers. Her sentence, “But, at the heart–at the core where it matters most–students will remember how we made them feel.” made me think. I haven’t been in the classroom for 6 years, but at the beginning of my last three years, I made home visits. This was on a strictly volunteer basis, and parents signed up at Open House for the time slots I had designated for these visits. Entering the homes of my students proved to be one of the most impactful things I did to know my students. Strong relationships – Not only did I build relationships with my students as they proudly showed me their homes, introduced me to their siblings, or their pets, I built relationships with parents, as well. To sit down in someone’s home does something to create a bond. They knew I cared or I wouldn’t be there. They appreciated that I spanned the distance between parent and teacher to show them that we were both working toward what was best for their child. There was a noticeable difference in our relationship in the days after those meetings. Understanding – When I walked into that house, I understood. I understood why homework was lost or homework was completed, why book bags were dirty and smelly or the latest in fashion, why some students were sad or scattered or happy or confident. This window into the lives of my students not only gave me empathy and compassion, but lead to creating goals, strategies, and practice in life skills. Memories – Some of my best memories of my teaching career were of my home visits. At one home, I was greeted with a couch full of four children, three pets, and two parents eagerly awaiting what I had to say. I shared dinner with families on more than one occasion. One family sang and played the piano for me, putting on a mini-concert. By visiting the homes of the students in my class, I made them and their parents feel important. Esteemed. I banished the arm’s length and sat at their tables or in their living rooms and visited with them about school and life. It was the “heart” of my classroom. This is an intervention. She has been with me for years, being sent to live with me by my parents. She was young and full of energy, even attractive and hard-working. However, she began to unravel a while back. Slacking off on her duties, resisting my direction, she has become hard to handle. I’ve lost control of her. She and my dog fight incessantly. She is noisy, unruly, and untidy. Eating things she shouldn’t has made her unable to do her job. Awful smells and noises follow her wherever she goes. When she started smoking, I warned her she might have to leave. She didn’t listen. I admit I had grown fond of her, and replacing her will be difficult. But it’s time. I mean, she rarely comes out in the open anymore. We just can’t depend on her. As I roll her out to the driveway to be taken away tomorrow, I hope she finds happiness with other vacuum cleaners at her new destination. Whew! It’s nice to have a quiet Saturday evening after an extremely busy week. Friday was full. When the day was over, I had worked 12 hours. Walking into the door of my home a little after 7:30, I was pleasantly surprised. My husband had picked up Chinese food from my favorite takeout joint, a Jimmy Connor from Sonic (my all-time favorite drink), and a beautiful bouquet of flowers. What a wonderful surprise! I am so blessed to have a husband who is kind and thoughtful. Frankly, he is sweet on me, and I couldn’t be happier. I hope I never take him for granted. I hope that I am as thoughtful to him when he has had a rough day. I hope all single girls wait for the guy who spoils them. Good looks fade and bodies age, but sweet hearts beat true forever. Ahhh…silence! How many times have I said that? It seems that from the moment we awake until the minute we fall into bed, there is noise. Mornings are filled with coffee makers, news on the TV, hair dryers, and showers. And school is no place for those who need a moment of silence! Even when we get home, there are children telling us stories, telephones chiming, washing machines churning, TVs blaring, and dinner cooking. So, where does calm fit in? Several times this year, after posting this quote in my office, I purposefully implemented silence. As educators, we have a plethora of decisions to make every day. As an instructional coach, I plan lots of events with teachers. Some of them (I know this will be a surprise!) are not exactly welcomed by all who attend. That means I must to prepare out of the ordinary, non-boring opportunities to learn. I am often asked to model lessons. Thinking outside the box takes silence. Jazzing up a lesson requires peace and quiet. When my brain is empty of ideas for an upcoming project, solitude is required. We definitely need to create stillness. Real stillness. And sleeping doesn’t count! Like good manners in children, silence just doesn’t just “happen”. Sometimes I close the door to my office. Often, I’ll drive with the radio off. It’s no surprise that often my best ideas come when I’m lying on a raft in my mom’s swimming pool on a peaceful summer afternoon. Here’s to silence, the great deliverer of wisdom. May you, in the hush of the afternoon when all the students have gone home, find enlightenment! At our Middle School, we began Lunch Date with a Book this year. Basically, each month, we read a Newbery award winner and discuss the book at the end of the month while enjoying lunch. Students may sign up at the beginning of the year, choosing their top three choices. The librarian and I put them into groups based on their choices. This year, we only invited fifth graders to see if it would catch on. Because of its popularity, we were delighted to add three more monthly meetings. This year, we had planned to read Flora & Ulysses by Kate Dicamillo, but it did not come out in paperback in time. 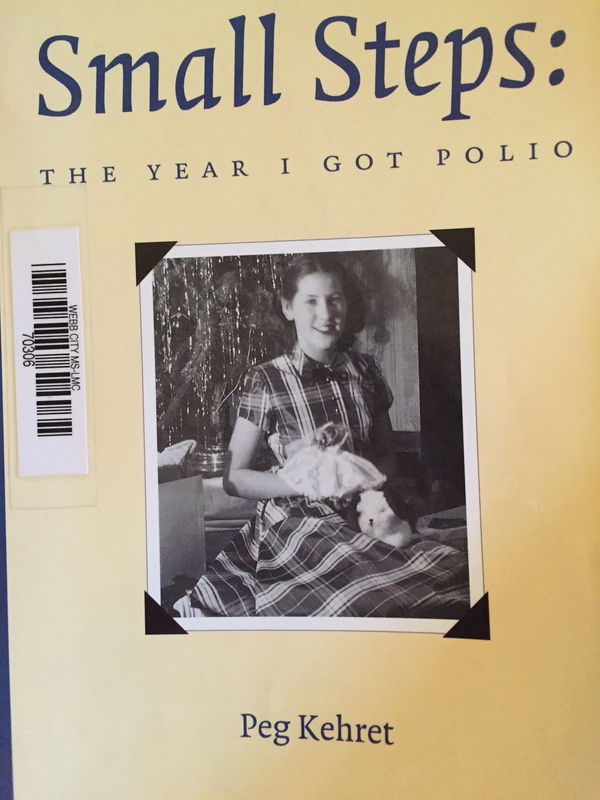 We scrambled to locate a book and came across Small Steps: The Year I Got Polio by Peg Kehret. Small Steps is the memoir of the author’s bout with polio when she was a seventh grader. The book chronicles her fight with the disease in 1949, before vaccinations were available. The story is heartwarming. One of my favorite lines is “A window of understanding opened in my mind, and the breeze of compassion blew in.” While in the hospital, she meets other girls her age who are also battling the disease, yet without families to support them for various reasons. It made me chuckle at times, and at other times, tears ran down my cheeks. I really didn’t know much about polio, its symptoms, treatments, or the effects of the disease, beside paralysis, before reading this novel. I would highly recommend this book. It kept my interest completely. I am looking forward to hearing the reviews from our lunch groups tomorrow. Each morning my eyes behold the beautiful sunrise. No matter what, I always have Someone on whom I can depend. Each day my needs are supplied. A group of educators who are excited about writing surrounds me. My mind is nourished with new knowledge every day. Creativity, bravery, and innovation are nurtured where I work. Honesty, kindness, and integrity are important in my life. I am shown appreciation for my hard work, uniqueness, and viewpoint. Many of my dreams have come true.